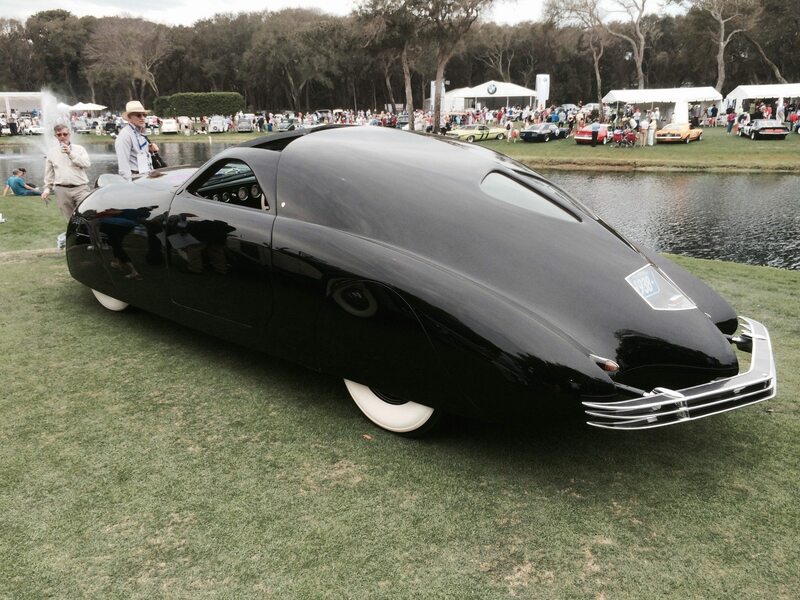 It’s tough to get a lot of attention with a cool car at the Amelia Island Concours – some would say the most eclectic Concours event in the country. 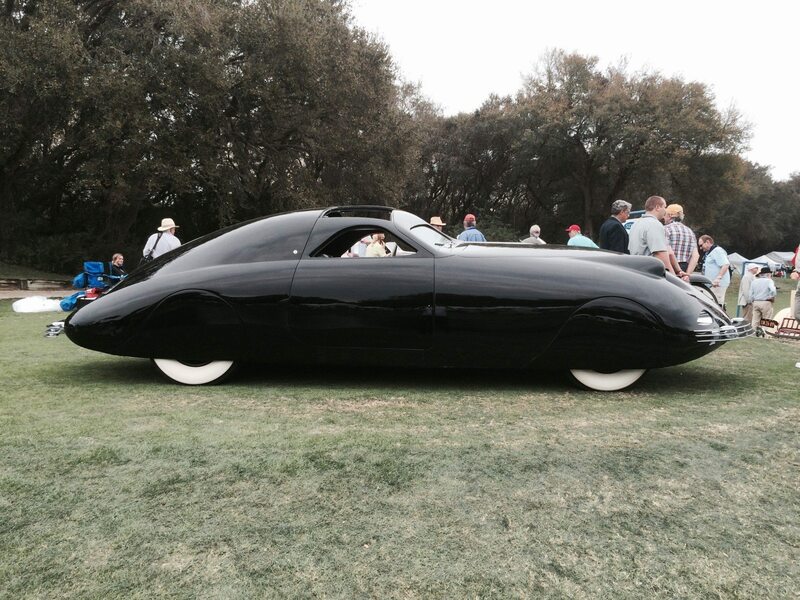 One car that certainly did in 2016 was the 1938 Phantom Corsair displayed by the National Auto Museum in Reno. From it’s perch on the 18th tee, it overlooked almost 300 incredible classic vehicles on the show field, and an incredibly diverse field of Cords, one of the special features this year. 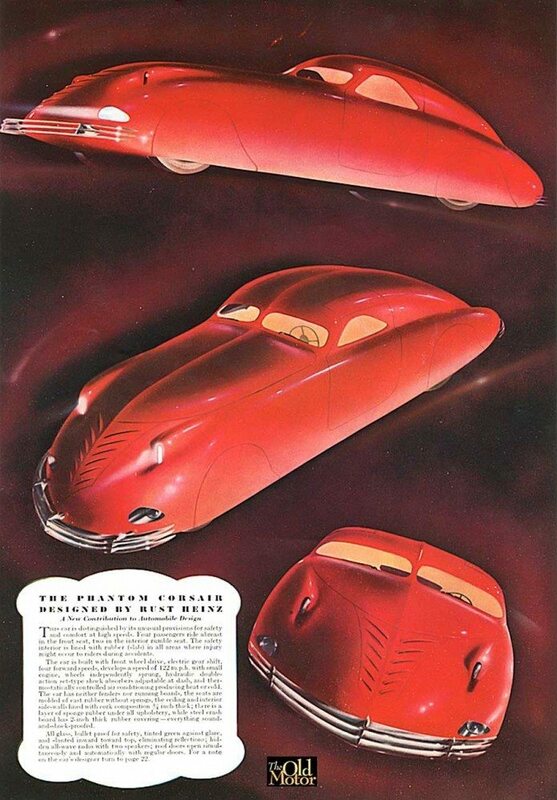 The Corsair was designed by Rust Heinz, heir to the Pittsburgh-based Heinz food empire, and envisioned by him as the “Car of Tomorrow”. With a background designing racing boats, and the considerable funding of his family, 21 year old Rust utilized Bowman and Schwartz to craft the Corsair utilizing a Cord 810 front wheel drive chassis and a Lycoming V-8 engine with electric shifting that was modified in Andy Granatelli’s shop. With a chrome moly chassis, no visible handles, running boards, or really any fenders to speak of, it’s as if those sleek drawings actually made it into steel and rubber. His design was developed with clay models and home-made wind tunnels, and it was certainly on the leading edge of automobile aerodynamics. It’s heavily padded and cork lined passenger compartment was quite futuristic, with 4 across front seating and bullet proof glass. It is a wonderful combination of extraordinary vision, mesmerizing design, and utter impracticality. , while also getting slightly more practical front wind screens in place. 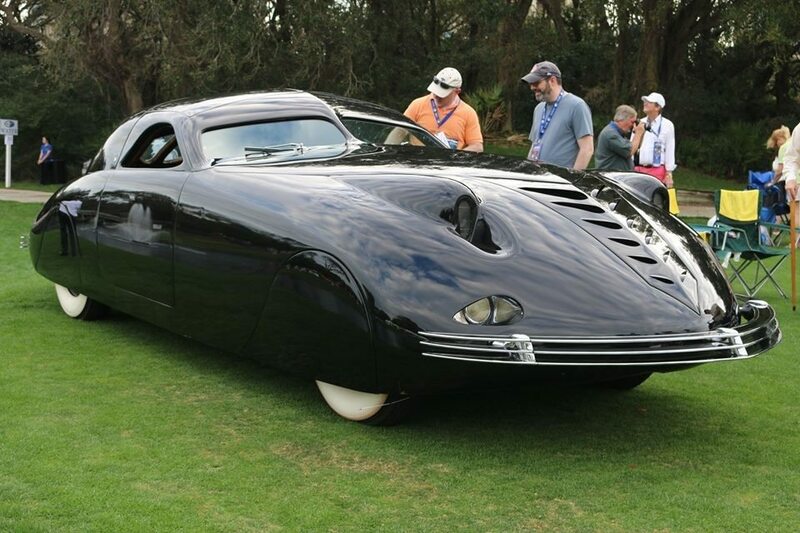 Sometimes called the “Flying Wombat”, it had a role in the Hollywood movie, “The Young in Heart” released in 1938, The Corsair does have a slightly pointed face and the inset eyes of the real Wombat, and it was stunning on display at the Amelia Island Concours. Thanks to the National Auto Museum and Hampton Wayt for fact checking, and please visit www.theoldmotor.com for the full story. If you have a prototype or another collectible you’d like to insure with us, let us show you how we are more than just another collector vehicle insurance company. We want to protect your passion! Click below for an online quote, or give us a call at 800.678.5173.